Growth focus: Bayer CropScience scientists. The company expects to launch 10 crop protection compounds globally by 2012. Monheim, Germany: India will receive a substantial portion of the €3.4 billion (about Rs21,522 crore) that Bayer CropScience AG proposes to spend on research and development globally over the next four years, underlining the country’s growing stature as a market for advanced farm products as well as a research hub. The agro-chemicals and plant biotechnology unit of German health care company Bayer AG has also applied to register in India most of the 10 crop protection compounds that it expects to launch worldwide by 2012. “India is important for us as a market as well as a strategic location for research and development and manufacturing," said chairman Friedrich Berschauer on the sidelines of the company’s annual press conference at its global headquarters in Monheim, Germany. Berschauer did not specify exactly how much Bayer CropScience has budgeted to spend in India or how many of its 10 compounds it will launch in the country. Bayer’s biosciences and plant biotechnology research facility in Hyderabad is one of its largest globally, and is soon to be expanded. Berschauer added that the company will set up another seed and plant biotechnology development centre in Hyderabad, and modernize its manufacturing unit in Vapi and Ankaleshwar in Gujarat. 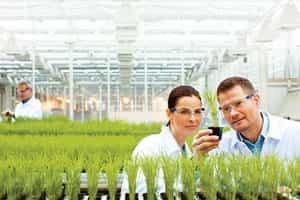 Bayer CropScience last week disclosed its global research investment plans as it looks at “long-term opportunities for growth on the agricultural markets". “Out of the total new global R&D investment proposed, the company will be spending almost €2.7 billion to develop innovative crop protection active ingredients, and €750 million for developing plant biotechnology products," Berschauer said. The company expects to achieve its global sales target of €2 billion by the end of 2009, two years earlier than originally planned. In bioscience, which is mainly focused in the Hyderabad research unit, Bayer expects global sales of about €1 million by 2015. The expansion of the Hyderabad facility is in line with the company’s strategy to develop new crop protection molecules, which drive the company’s sales and earnings. Though it expects to generate most of its sales growth on its own, the company will also tap opportunities for alliances and acquisitions in the seed and biotechnology business. Bayer CropScience’s bioscience business rose 15% to €304 million globally in the first half of 2008. Much of this expansion, which is higher than the company’s annual growth in health care and agrochemicals, came from growing cotton seeds, or Bt cotton, in North America, Mexico and India, and from demand for hybrid rice varieties in Asia. India’s agriculture sector “offers attractive opportunities for agrochemicals and biotechnologies companies on the back of rising income levels and consumption levels, resulting in rising food prices," said Rajen Shah, chief investment officer at Mumbai-based Angel Broking Ltd.
Angel Broking views agriculture, valued at around Rs9 trillion, as the “next big investment opportunity" in India, Shah said. C.H. Unnikrishnan was in Monheim, Germany, as a guest of Bayer CropScience AG.